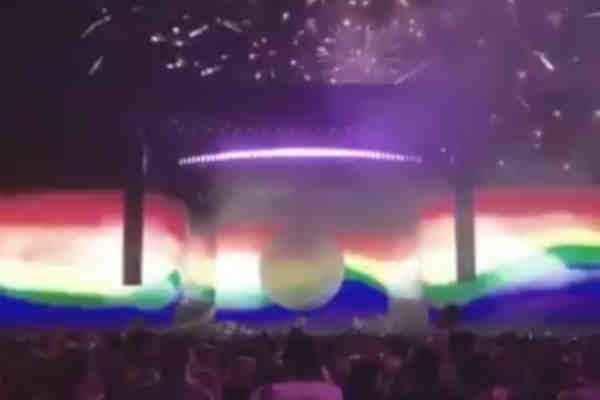 Performing over the weekend at the Coachella Valley Music and Arts Festival in California, Ariana Grande ended her performance with a giant projection of a rainbow flag, a symbol of the LGBT community. At the end of her set, fireworks were set off and a giant Pride flag was displayed across the screens. Many artists have refused to perform at the venue in protest of Philip Anschutz's charitable giving. Anschutz, a billionaire, owns Coachella organizer Goldenvoice and half of the festival through his entertainment company AEG. Anschutz, a Christian conservative, has, through his foundation The Anschutz Foundation, given to groups opposed to LGBT rights. Anschutz has denied that he's opposed to LGBT rights and has said that his foundation stopped giving to certain groups upon learning about their opposition. He also contributed $1 million to conservative candidates in the 2016 election. Last year, he donated $1 million to the Elton John AIDS Foundation LGBT Fund. On social media, many users said that Grande's rainbow flag was directed at Anschutz.